There is a financial restructuring plan in place, said Suresh Prabhu. 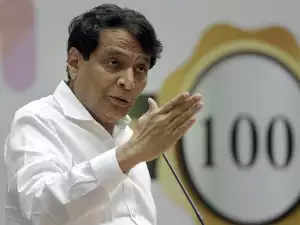 With airlines in the country facing issues in Pratt & Whitney-powered Airbus planes, Aviation Minister Suresh Prabhu Friday said passengers' safety has to be paramount and there is zero tolerance for any violation of relevant guidelines. He said that ensuring safety is a responsibility of the Directorate General of Civil Aviation (DGCA) and "we have already directed them that at any cost, safety has to be paramount". "We have already given them complete freedom to operate. They (DGCA) have been directed to conduct safety audit not just of airlines but also all aspects of aviation, including aviation infrastructure. So, they are doing it," Prabhu added. P&W engine woes had forced both GoAir and the larger rival, IndiGo, (which operates 57 such planes) to ground some of the A320 Neos on earlier occasions too. The DGCA Wednesday said it will issue within a week an additional safety protocol directive to the airlines, which have been facing issues in P&W-powered Airbus planes. Speaking about the Air India's problems, Prabhu said Friday that future revenues of the company cannot service its "massive" debt and this legacy issue has to be segregated from the present challenges of national carrier. "If you feel that future revenues can actually service the debt, it is not possible for the simple reason that the debt is so massive," he said during the livestream held on the topic 'Flying for All: Global Aviation Summit 2019'. The loss-making Air India is estimated to have a debt burden of more than Rs 48,000 crore and the government's efforts for strategic disinvestment of the carrier failed in May last year. The Air India has been making losses since the merger with Indian Airlines in 2007. "We have prepared a plan... we are trying to professionalise the entire management of Air India, right from the CEO downwards so that there will be a proper management structure so that Air India can reach to newer heights," he said.